Mix all the ingredients in a bowel until mixture is in a consistency to roll balls into. If the consistency is too thick then just add a little more water in. 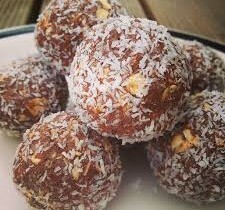 Roll into balls (should make about 12-14 balls) and then into the coconut. Refrigirate and enjoy 1-2 balls as a mid-morning or mid-afternoon snack.